“Is this your first! ?” It’s a question I’ve heard dozens of times over the past six months, and I’m sure to hear it dozens more times over the next six. It’s a question that, for me, has so many answers. I have to weigh the situation, the asker, the onlookers, the others involved in the conversation, the time available for the answer, the actual interest of the asker, and how I’m feeling that day before I can provide an appropriate answer. I basically chart out a full-on Pros & Cons list in my head before I open my mouth to ensure I answer tactfully and gracefully and don’t entangle myself or others in a weird or uncomfortable situation. No, this is not my first child. I lost my first child to miscarriage 13 years ago. But who mentions a miscarriage in this scenario? I’m never seeking sympathy from random strangers who are curious about the state of my adorable pregnant belly. I have nothing to gain by bringing up that situation. The only gain that I can think of is trying to tear down the stigma of miscarriage. I don’t feel stigmatized, but many women do. I don’t shy away from the fact that I lost a baby, and I am always open to talking about it – the women who can’t, who keep quiet due to embarrassment and shame or heartache, need my voice to speak for them. But that doesn’t mean that telling the lady at the front desk about my miscarriage is appropriate when she was just curious and asked if I was carrying my first child, a question that required a 30-seconds-at-max answer. My relatively in-tune social skills tell me that the asker of this question is actually asking if this is the first time I’ve been this pregnant. I haven’t answered the question this way yet. No, this is not my first child. I lost the first child to whom I gave birth to adoption 11 years ago. But when you answer a stranger with “No, my first child is 11 but she’s adopted”, they tend to get confused and wonder if I adopted a baby 11 years ago. They often don’t consider that I’m a birthmother – one of those people who ‘gave away’ a child. I’m also not particularly comfortable with my ‘birthmother status’ – I do not enjoy sharing that part of myself with single-serving-acquaintances (people I’ll never see again and who won’t get the full story of why I’m a birthmother). There’s not enough time to explain why I relinquished my daughter, and usually the question-asker isn’t actually interested in hearing a story, so regaling them with the details of abuse and heartache seems wholly unnecessary and inappropriate. My relatively in-tune social skills tell me that the asker of this question is actually asking if this is the first child to whom I have been a mother; answering ‘no’ just doesn’t make sense. I messed this one up at my dentist’s office a few months ago: we hadn’t told anyone besides close family and friends, and I didn’t look pregnant yet, but I informed the hygienist because it seemed relevant in case they needed x-rays or something. She asked if this was my first and I automatically replied ‘No’, and she proceeded to ask a dozen questions…what gender was my first (girl), what gender is this baby (boy), what gender did we want (girl), why would we want a girl if we already had a girl (ummmmm), how old is my daughter (10 at the time), oh wow so this is like starting over with a new baby! (well…yeah…um), is my daughter excited about the new baby (oh crap). It got sticky and awkward for me almost immediately. And I played along, too embarrassed to correct the situation and tell this stranger one of the most intimate details of my life. I felt so many things after that conversation: embarrassed, stupid, raw. I talked with Ryne about it because it weighed on me so heavily…how do I tell the truth when there is more than one truth? He told me that when people ask him if this baby is his first, he replies ‘yes, it’s our first’. A totally truthful statement. It could bring up additional questions from the asker, assuming they notice the verbiage change, but if they really wanted to know, that’s the appropriate time to tell the condensed version of my story. Yes, this is our first child. This is the child that takes the ‘couple’ that is me and my husband and makes us a ‘family’. He is not my first child, but he is our first child. He will have an older sister who lives with different parents in a different home. He will hear me and his dad talk about her, and he will know our story. In my heart, I have three ‘first children’. That’s my unique truth, but that doesn’t mean I have to share it with every person who asks. Do you have a unique family situation that’s hard to explain when single-serving-acquaintances ask? Tell me about it in the comments! 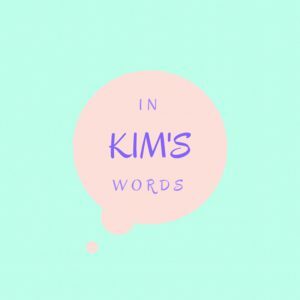 Remember to subscribe to In Kim’s Words for more heartfelt posts about my story and my family! I always tell people I have two sons and when questions get to a point where I don’t really want to engage any further, I change he subject. I’ve told them as much of he truth as they need to know. However, I’ve never been in your particular situation, so I’m guessing that would be painful. But I’ve heard more than woman say that being completely out of the closet is so very freeing (our friend Pat, for instance) and that is my goal – in my own time. Well….my unique story is that I consider myself the oldest mom with the youngest child. With that being said, I birthed a daughter at the age of 41. Having already birthed 3 sons; the first at age 23, who passed away at the age of 31 in 2005; the second at age 36, birthed in 1985, passed away at 2 & 1/2 days old in 1985; the third at age 36 who is now 31. Last, but not least, I birthed a daughter and lost her to adoption by my relinquishment in 1992. I am 68 and she is now 26. Your story certainly is unique – I’m so sorry for your losses. Thank you for sharing, Norma!